Click on Covers to view a larger image. 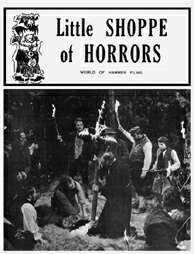 LSoH first appeared in 1972. Newly discharged from the Viet Nam era army, I was excited to show my interest in classic horror films, influenced by great fanzines like GORE CREATURES (later to be MIDNIGHT MARQUEE), PHOTON and CINEFANTASTIQUE. The early issues were rough, but we were learning and making contacts throughout England – as Hammer would eventually be our main focus. First published June 1972. Went through three printings. 70 pages with 40 stills. 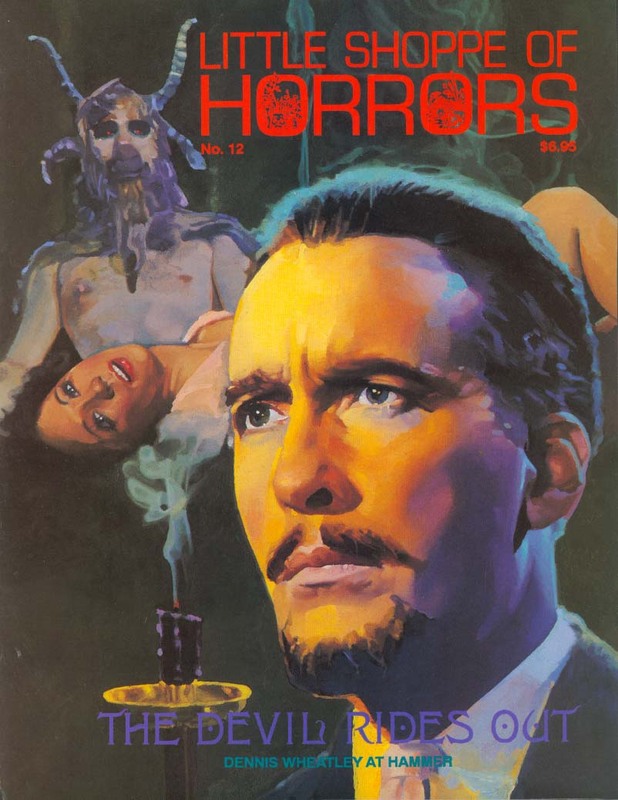 Featured: AIP: A Brief Visit to the World of Monsters, Motorcycles and Beach Parties; A Visit with Roy Ashton; A Visit to Hammer’s Bray Studios, reviews of current Hammer and other horror films; and HAMMER: THEIR WORLD OF FANTASY FILMS. First published March 1973. Went through three printings. 86 pages with 80 stills. 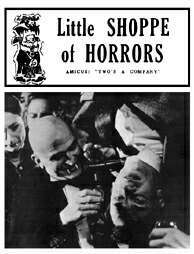 A Tribute to Bernard Robinson (Hammer’s set designer); AMICUS: TWO’S A COMPANY (extensive history of Amicus, with interviews with producer Milton Subotsky, director Freddie Francis and screenwriter Robert Bloch); many current film reviews; interview with Spanish horror superstar, Paul Naschy. First published February 1974. Went through 2 printings. 104 pages with 100 stills. 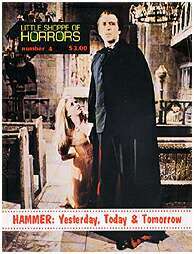 The Films of Eiji Tsuburaya (Japanese effects master); Andre Morell: Actor (interview with Dr. Watson from Hammer’s HOUND OF THE BASKERVILLES); Lon Chaney, Jr. – A Tribute (with his interview from Johnny Carson’s Tonight Show); The Music of Hammer; Interview with Vincent Price; Terence Fisher interview (huge interview with the premiere Hammer director. Dozens of rare behind the scenes photos). Published August 1980. 28 pages with 38 photos. 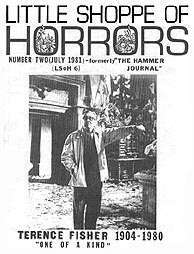 For this one issue, I thought to start a four-times-a-year newsletter devoted to Hammer. About that time, Michael Carreras lost Hammer and the new owners weren’t too keen on such a fan organ (they were busy trying to buy the company!). So this issue – only 400 copies printed – is the hardest to find, and the one I will one day reprint to bring down the cost for it on the open market. 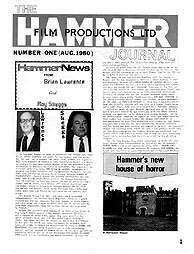 Lots of Hammer news, the new HAMMER HOUSE OF HORRORS TV series, and interviews with Syd Pearson (SPFX Man) and producer Anthony Hinds. Published July 1981. 48 pages with 75 photos. 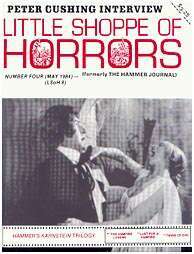 Reviews of the first 13 episodes of THE HAMMER HOUSE OF HORRORS; A Tribute to Terence Fisher (with contributions from many who worked with him); interview with James Bernard (Hammer music composer). Published December 1982. 72 pages with 100 photos. 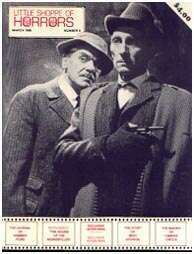 The Quatermass series, with interviews with Val Guest & Nigel Kneale; Interviews with Barbara Shelley, Harry Robinson and Josephine Douglas (producer of DRACULA A.D. 1972); Doug Murray on collecting Hammer (went three issues); Brian Clemens on CAPTAIN KRONOS: VAMPIRE HUNTER; photo tour of Bray Studios. Published May 1984. 96 pages with 137 photos. 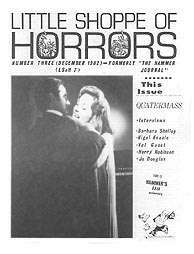 Our first theme issue, covering the “Karnstein” films, THE VAMPIRE LOVERS, LUST FOR A VAMPIRE & TWINS OF EVIL. Over twenty interviews with producers, directors, screenwriters and actors. Plus a lengthy interview with Veronica Carlson (DRACULA HAS RISEN FROM THE GRAVE actress). Published April 1986. 120 pages with 168 photos. 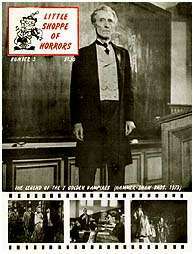 The Rise and Fall of FAMOUS MONSTERS OF FILMLAND; coverage of THE HAMMER HOUSE OF MYSTERY AND SUSPENSE; “Bray Ghosts”: The Story of Bray Studios; the making of VAMPIRE CIRCUS (Interviews with producer Wilbur Stark, Director Robert Young and screenwriter Judson Kinberg); A look at THE HOUND OF THE BASKERVILLES; interviews with Yvonne Monlaur, Terence fisher, Jack Asher, Michael Ripper and many more. One of my favorite issues. Published July 1990. 172 pages. First full color cover painting by Steve Karchin. 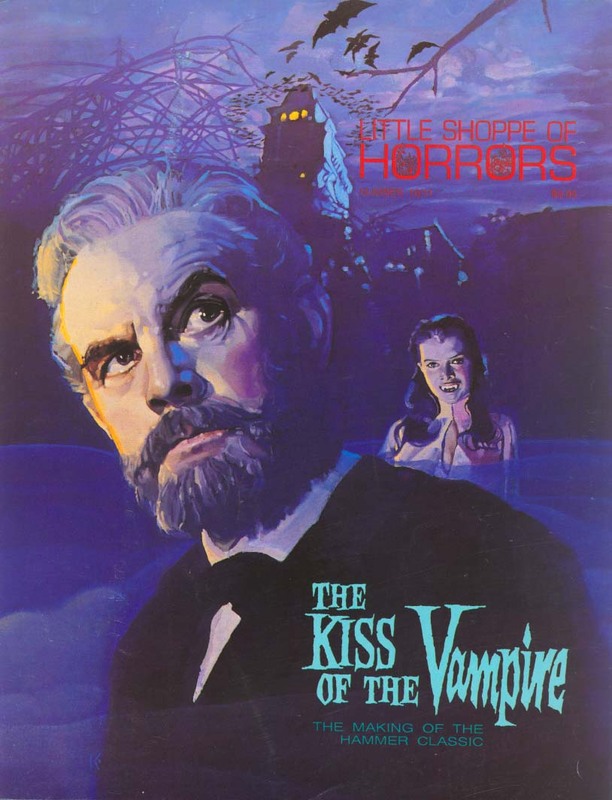 The Making of KISS OF THE VAMPIRE, with interviews with director Don Sharp, Producer Anthony Hinds, music composer James Bernard and actors Isobel Black, Jennifer Daniel and Edward deSouza; Music for the Hammer Horror: An In-depth Examination (interviews with music director Philip Martell and composers David Whittaker, Harry Robinson & Malcolm Williamson); the Unfilmed Hammer: An A to Z guide; Two Titans of Animation: Ray Harryhausen and Jim Danforth; Interviews with Andree Melly, Oscar Quitak, John Carson, Thorley Walters, Linda Hayden and Jenny Hanley. Published April 1994. Steve Karchin color cover painting. First 4 page color cover. 132 pages. “Dennis Wheatley at Hammer” The Making of THE DEVIL RIDES OUT, THE LOST CONTINENT & TO THE DEVIL A DAUGHTER with interviews with Christopher Lee, Michael Carreras, Charles Gray, Anthony Hinds, Rosalyn Landor, James Bernard & Dana Gillespie; Sir James Carreras: The Man Who Would Be King; I Met David Peel; The Ladies of Hammer – interviews with Raquel Welch, Valerie Leon, Stephanie Beacham and the story of Yutte Stensgaard; QUATERMASS AND THE PIT Revisited – interviews with Barbara Shelley, Julian Glover and Andrew Keir; Hammer’s Old Guard – interviews with Noel Willman, Francis Matthews and Hugh & Pauline Harlow; Horrors of the Black Nylon Museum. Published December 1999. 132 pages. Front cover painting by Jeff Preston. 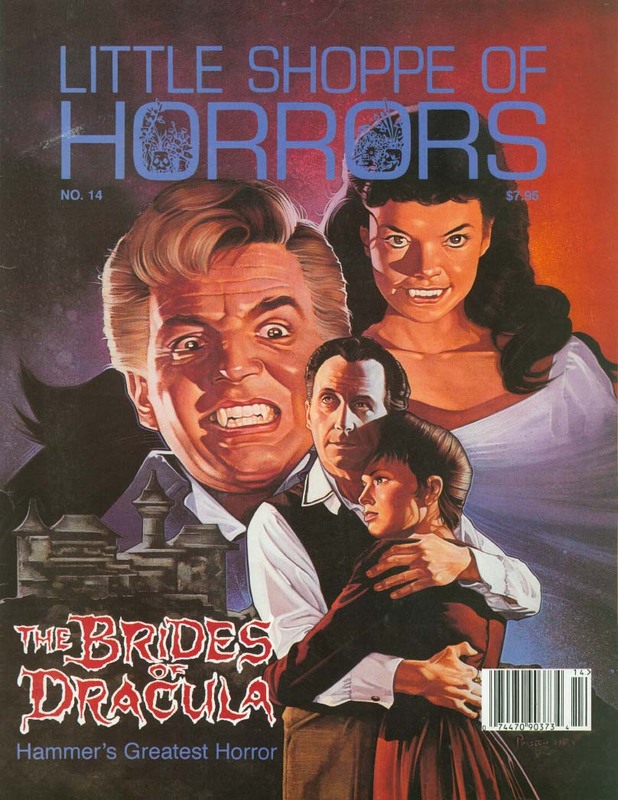 50+ page “Making of article on THE BRIDES OF DRACULA” (Hammer 1960) by Bruce Hallenbeck; exclusive interviews on the film with Peter Cushing, Anthony Hinds & Andree Melly. Never before published quotes with director Terence Fisher and other behind-the-scenes personnel; Margaret Robinson on Bernard Robinson and his sets for BRIDES OF DRACULA (with original set design photos); Part Two in our “Ladies of Hammer Interviews” – Yutte Stensgaard (LUST FOR A VAMPIRE), Madeleine and Mary Collinson (TWINS OF EVIL); Janette Scott (THE OLD DARK HOUSE & PARANOIAC) and Janina Faye (HORROR OF DRACULA); Hammer’s Old Guard – interviews with Renee Glynne (Continuity Woman) and William “coco” Epps (Bray Studios/Hammer driver); tributes/interviews with Len Harris (camera operator) and Roy Ashton (Makeup man). Plus – interviews with John Peverall (1st Assistant Director) and Tom Edwards (Stills photographer). Interior artwork by Bruce Timm, Neil Vokes and Murad Gumen. All these issues are now available again in print form for $12 + postage. Go to our order section!